For the first time in Germany, consumers shall soon be guaranteed the right to information about food and certain other products. Despite opposition by the CDU and the FDP, the Bundestag passed the Consumer Information Act [Verbraucherinformationsgesetz], which was a central reform project of the Red-Green Coalition. The law is scheduled to go into effect in January; however, it's still uncertain whether the Bundesrat will approve the law. According to the law, federal, state and regional authorities will have to allow consumers unrestricted access to information about food and some consumer goods. Unfortunately the conservative CDU/CSU majority of the Upper house (Bundesrat) did not approve the law. There is increasing displeasure within the Grand Coalition government over German President [titular head of state] Horst Koehler. Following the example of leading CDU/CSU politicians, the SPD has now also distanced itself from Koehler after he refused to sign a government bill [which is necessary for it to come into effect as law]. SPD caucus manager Olaf Scholz accused Koehler of having overstepped his authority by vetoing the Consumer Information Law. Scholz's CDU/CSU counterpart, Norbert Roettgen, had earlier expressed similar sentiments. Chancellor Angela Merkel, meanwhile, via a spokesman, indicated that any lectures directed at Koehler must cease. Berlin. The vice president of the German Bundestag, Thierse, issued a call for improved coordination among Germany's President and Parliament. The background are two planned legislations drafted by the Grand Coalition the head of state refused to sign over the past few months. Thierse stated that a large number of lawyers had examined the Consumer Information Law, for example, during the parliamentary proceedings. Koehler's veto, however, caused public malice of the Bundestag and the German government, a difficult constellation. Koehler had refused to sign the Consumer Protection Legislation, and the legislation concerning the privatization of air traffic control for constitutional reasons. Berlin. The federal Cabinet has approved the corrected version of the Consumer Information Law. German President Horst Koehler had refused to sign the original bill [thus preventing it from coming into effect] in December, due to reservations he had about its constitutionality. He saw it as violating provisions of the federalism reform package because it allowed the federal administration to require municipalities directly to provide certain information. The revised version has the state-level governments as middle-men; otherwise, there are no substantive changes. It obliges authorities to disclose violations of food laws or threats to consumers' health, and to name the companies involved. It also allows consumers to inquire what government agencies know about specific food products. The new Consumer Information Law has been sharply criticized by the Opposition in Berlin. Even though the bill was re-worked over a four-month period, its fundamental problems have not be fixed, said Green Party politician Ulrike Hoefken. She told RBB radio that, for example, the release of information could easily be refused by calling it a 'trade secret'. The FDP was also critical. The Federal Association of Consumer Groups complained that food companies are exempt from the disclosure obligation. The Upper House (Bundesrat) passed the 'Law on Consumer Information' that will provide the buyers with information concerning the risks risks of foodstuffs, cosmetics, garments and toys. Apart from that, the names of blacklisted companies need to be made public when expired/rotten meat had been sold or pesticide thresholds breached. Critics think the law does not go far enough, as companies concerned could claim that the information was commercially sensitive - except where there were acute health risks or offences had been committed. The 'Law on Consumer Information' was published in the Law gazette (BGBl. I S. 2558) 5. November 2007 and went into force 1. May 2008 in the federation and approx. 8 of 16 states. 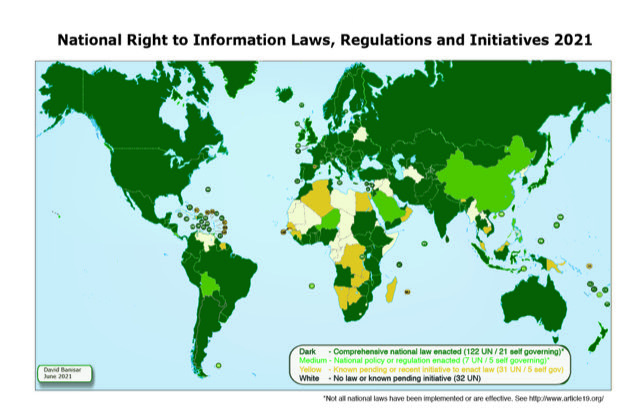 In addition to the Freedom of Information Act (in federation and 9 states) also the Environmental Information Act (UIG) and the Consumer Information Act (VIG) grant citizens the right to information in connection with the public administration. However, the separation of these claims is very difficult and its conditions and the respective procedures are different. Therefore, it would serve the interests of persons and of freedom of information if a harmonisation could be achieved.